Ever wanted to control your notifications on Apple’s iOS 8? After all, depending on the time of day, or your circumstances, you might not wish to be disturbed with a particular set at one time, like any notifications at all when you’re sleeping. Thankfully iOS’ Do Not Disturb covers that quite effectively, but it still leaves out a lot of room when user customization is required. Android in this regard is miles ahead of iOS, but thanks to tweaks, you can now bring this feature on your iPhone/iPad/iPod as well. Thanks to Cydia, you can now somewhat replicate Android Lollipop’s Interruptions feature on iOS. All you need to do is install Stunden on your device, and you’ll be good to go. 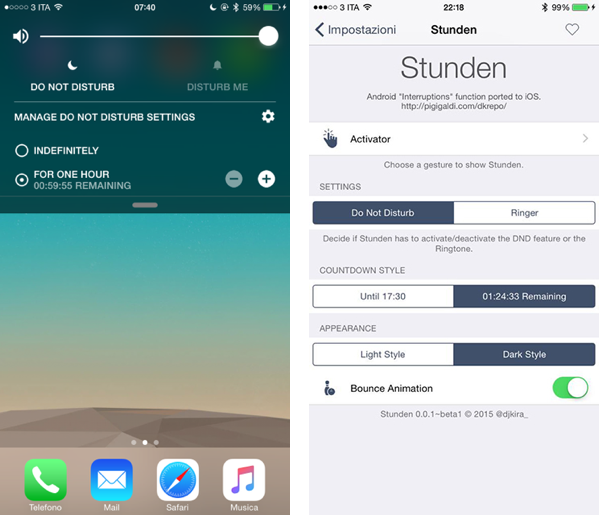 As you can see in the image above as well, after you’re done with Stunden, you’ll be able to access iOS’ Do Not Disturb option in an entirely different manner, with some extent of customization also added to the mix. Not only this, but Stunden also comes with its own set of options, that can be accessed by launching the tweak. You can take a look at these in the image above. Stunden will end up costing you $1.00 on Cydia and can be purchased through the default ModMyi repository in Saurik’s app store. You’ll also be needing to install Ryan Petrich’s Activator package on your device in order to access the tweak. Installing the Activator is relatively simple; the first thing you’re going to need to do is add the following repository in Cydia: “http://rpetri.ch/repo”. Once you’re done with this, you’ll be able to download and install the Activator package on your device. Sounds simple? Let us know how the process went for you in the comments section below.